BLONDE CRAZY stars James Cagney and Joan Blondell as a Depression-era hotel bellhop and maid who decide they can make money faster as scam artists. Since Cagney and Blondell spend much of the film stealing from people who aren't very nice themselves (including Louis Calhern and Guy Kibbee), they're able to retain audience sympathy despite their unsavory "occupations." It doesn't hurt that they're likeable, especially Blondell, and the audience is also distracted by the mile-a-minute dialogue and several changes of location. That said, it's the kind of movie where it suddenly hits the viewer that the leading couple are crooks! That definitely helps identify the film as a pre-Code, along with racy dialogue and a bathtub scene for Blondell, not to mention characters drinking a whole lot of then-illegal liquor. Although Blondell loves Cagney, she decides to go straight and marry a decent young businessman, played by an impossibly young Ray Milland. (I'd like to know where the wedding scene was filmed, the church exterior looked like a location shoot.) As it happens, Blondell has a surprise or two coming from Milland as well. This 79-minute film breezes along steadily, with a nice plot twist or two. (As a matter of fact, one twist near the end made no sense to me at all, but I don't want to give away that much of the plot!) Cagney veers a bit toward the obnoxious but usually manages to reel it back in just in time. As for Blondell, she must dish out more slaps in this film than any movie in history! All in all, it's a fun little movie and a good exemplar of what made pre-Code films unique compared to films released after July 1934. It's of note that the 1931 song "When Your Lover Has Gone" was featured in BLONDE CRAZY, and of course it became an American standard. It was written by Einar Aaron Swan. The supporting cast includes Noel Francis, Ward Bond, Polly Walters, Maude Eburne, and Charles Lane. 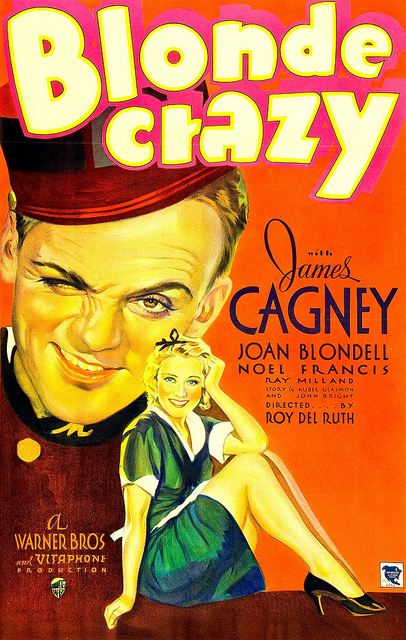 BLONDE CRAZY was directed by Roy Del Ruth. The cinematography was by Ernest Haller and Sid Hickox. Haller would go on to win the Oscar for GONE WITH THE WIND (1939). BLONDE CRAZY has had a release on VHS. It's also shown on Turner Classic Movies. The trailer is here. November 2014 Update: BLONDE CRAZY (1931) is coming to DVD from the Warner Archive as part of the Forbidden Hollywood Collection, Vol. 8.